To enter the rush of combat is a love that almost all barbarians thirst for. Whether they’re crushing a goblin’s skull with a maul, splitting a kobold in twain with a greataxe, or piercing a mighty lion with a spear, they all have the drive and certainly the means to conquer their foe. However, here are many barbarian cultures who believe the best way to sate their thirst is to engage their foe with their bare hands. The feeling of a crushing skull under their knuckles or a broken rib under their feet nearly brings them to ecstasy. This path was designed with a more support style of play than we traditionally see from the barbarians. 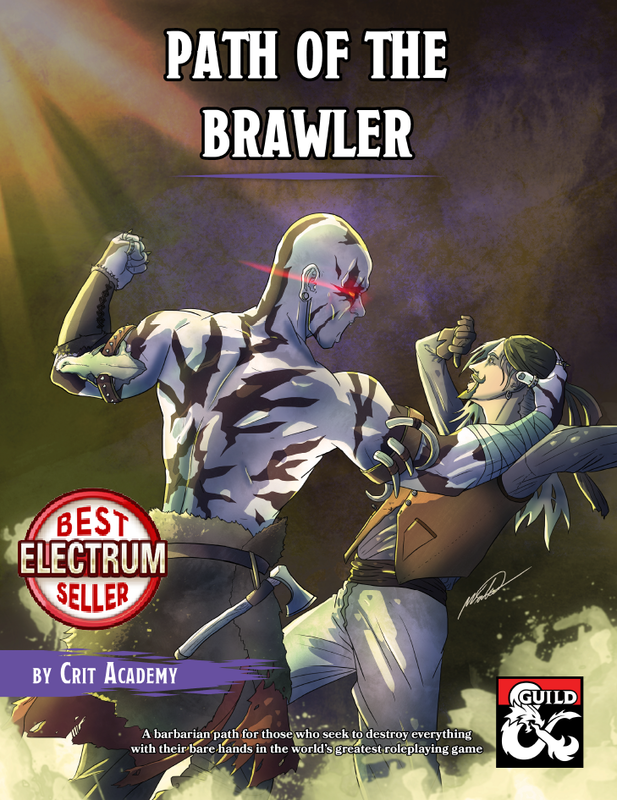 Using your action to grapple and knock enemies prone, allows the brawler to help gain their allies the upper hand, and help prevent those enemies from attacking weaker allies...all the while pummeling their foes with a boot stomps to gut and headbutts to the face. Our products are living documents, and as such, can greatly benefit from your support. Consider giving your support in any or all of the following ways. Leave a review, open a discussion below, tell a friend, share on social media. These little gestures can help us improve our products moving forward. Allowing us to pay for new art, layout and writers on future products.